/ Can I Be Paid to Review Products on Amazon? Can I Be Paid to Review Products on Amazon? I get email from a lot of little companies offering to buy me products if I’ll leave reviews on Amazon.com. Seems like the deal is that I buy the product on Amazon as usual, then they pay me back for the full cost via PayPal or similar. Is that legit? Can I get in trouble for leaving paid reviews on Amazon? Amazon does not want fake reviews. People don’t want to read fake news. You are undoubtedly against fake friends too. It’s all the same thing; one thing masquerading as something else. Now I know the argument, that you can still be unbiased and honest with your review regardless of whether the company bought you the product or not. Well, maybe, but the majority of people are more than happy to trade a 5-star review for something free. Even if they actually don’t like the product. You can imagine the long term results; people go shopping online, rely on the reviews, and make purchase decisions based on customer feedback. Except the feedback is bogus and has been bought by the company for just a few dollars a pop. End result is that we all learn to ignore reviews and star ratings, rather a lose:lose. Amazon also has specific details about what it prohibits, but most of that information is merchant-facing rather than something we regular customers see. But let’s step all the way back and look at the process. 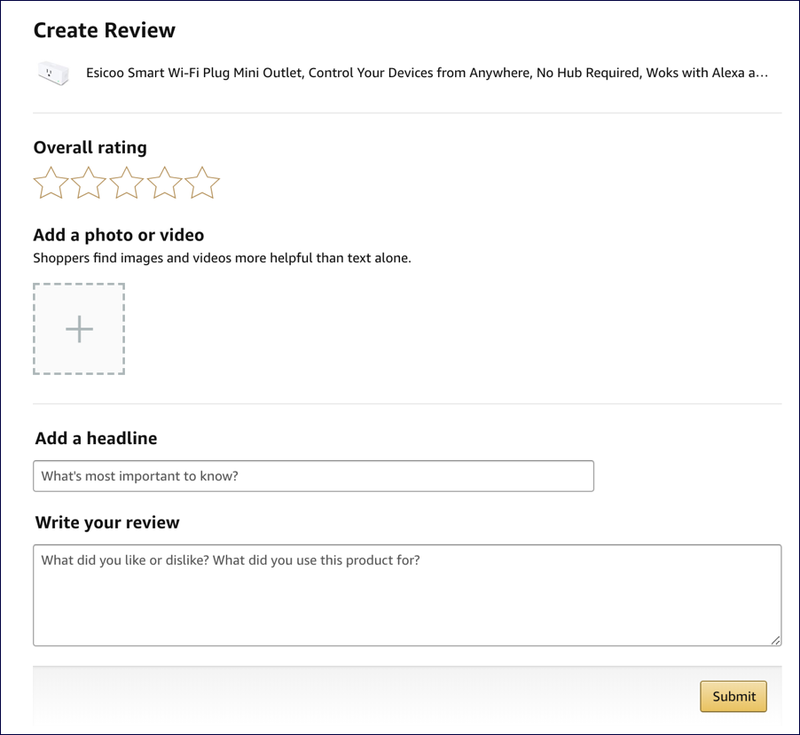 First off, Amazon really wants you to have purchased the product through Amazon.com to leave a review. That’s what a “verified review” is: one from someone who actually bought it! Nowhere is a warning about “don’t cheat” and there’s no link to the “terms of review”, so I guess you could say that it’s understandable some people get confused about these terms of service. Heck, something for nothing? And you’re going to be “honest” about your review? What’s wrong with that? Remember, these are prohibited interactions, and what you’re talking about falls into the category of “compensation in exchange for a review”, even if the vendor cunningly says “you can just have it and if you want you can leave a review”. The wording might be canny, but the intent is pretty clear. This is something that we product reviewers have to wrestle with on a daily basis, of course. I review tons of gear on my YouTube channel – AskDaveTaylor, I hope you’re a subscriber! – and almost all of it is sent to me by the vendor. I disclose that and I warn the vendor in advance that I’m honest and will be critical of their product: no free ride for ’em regardless of the value of the product. Sometimes I do leave a really critical review and once in a long while the vendor then refuses to supply any other product, sometimes for many years. That’s their choice. My focus is on you, the viewer and reader. Is it similar to this prohibited review situation on Amazon.com? Yes, it obviously is. Which is why you as a consumer need to learn which reviewers to trust and which are shills dressed up as a reviewer. Anyway, what’s your thinking about all of this? Leave a comment, let me know! And in terms of Amazon? My recommendation is to skip all of it, or respond to them that you’ll be happy to review their products on Facebook or Twitter instead. Good luck! Regarding giving reviews, I shop on-line a lot and have got fed up with, not only Amazon, but other online stores too, sending me emails asking for a review of their product. Having put up with this for a long time, I started to reply “I charge £2 for a review, please let me know if you wish to participate”. No-one ever does!! I have never received payment for a review, or even a free product, but the “please” review” emails just keep coming. In the main, I just delete them unless a particular service has been outstanding.